Why would you post this so early in the morning?! I now want me some!!! 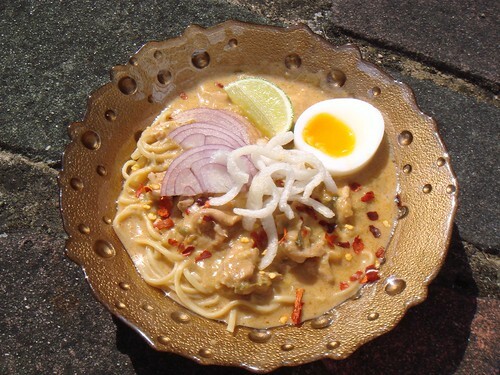 This looks amazing, it *looks* similar to Laksa but different taste. Will definitely have to make this for tea this week! This looks gorgeous. I want to try this. Plus, next time Emma asks me what Burmese food is like, I can do more than simply reply, "You know, like, food they eat in Burma." This has made my mouth water and October can't come soon enough. @Becs - Yeah, laksa's the way I usually describe it to people but it's not powerful/pungent like laksa. I want Burmese cooking classes! Yum, yum! Now what could I use instead of the chicken? I'm thinking something like quorn or tofu for appropriate texture, rather than a vegetable? This looks really good - will certainly have to try it. @Su-Lin - Yeah, it's all fairly easy to get hold of except maybe the gram flour. I use Natco which you can get in most Asian shops. I can't believe you put the garnishes on the side. Only kidding! I mean do I look like a greengrocer? This looks wonderful, especially the slightly soft boiled egg which just begs to be dipped in with the crispy rice noodles. I love this dish, and have had a recipe for years that I haven't got around to making. I will have to now. @Rabia - I never knew that - cool! I love the sound of the slims. 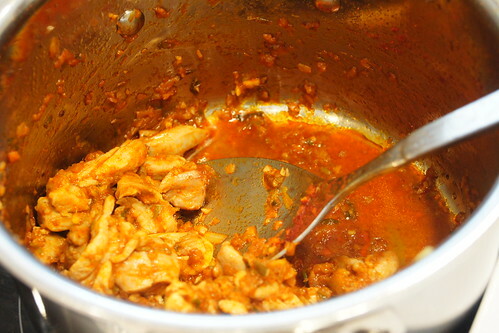 @Sharmila - Do post your recipe too - variations are always great! Nice dish MiMi but how would YOU season it? That looks delicious. I bet the coconut milk makes the chicken and the noodles velvety. @Food Urchin - To taste, innit. @Alibhe - Cool, thanks! And I'm impressed you have the flour! Mimi you have just solved my dilemma for tomorrow night's dinner - have everything except the flour but have to go to Brixton market and they have it there. I love laksa so am thinking this will be a definite treat. This looks lovely ,just wondering what it would be like with all rice noodles?Have you ever tried? @bron - Ooh, let me know if you do make it! @Northern Snippet - If you want to use rice noodles, go for bun noodles which are thick round Vietnamese ones. You need to have the fat texture for the sauce to cling to. Making it was a hugely satisfying convivial, bonding family affair, lasting hours, from the cooking, extending through the meal and into the doing of the dishes. Didn't understand what was said in Burmese but enjoyed it all the same. Thank you for the recipe. Mimi, I am cooking a dish from every country in the world on my blog and would like to ask your permission to use this recipe (with credit and a link to your site, of course) for my entry on Burma - it's going to be preceded by Laphet Thoke, the pickled tea for which I have just found via mail order! 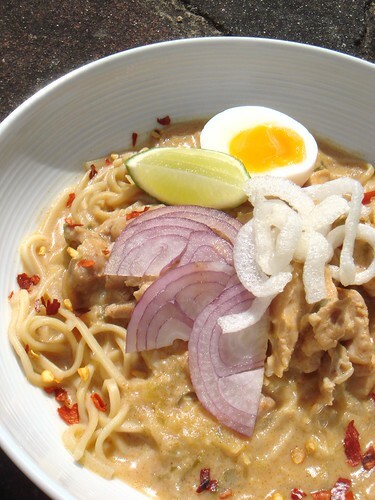 One question though - what is the most common choice in Burma for the noodles: egg or wheat?!?! I can't seem to get a solid answer on this. 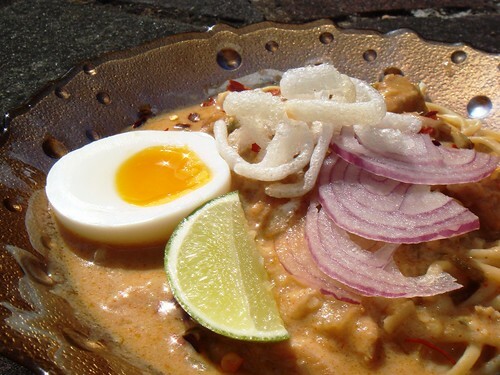 Was looking for an authentic khao swe recipe...guess I just found it. Thanks! I must say this dish is simply amazing. I had learnt it from my mother who prepares the dish in a most divinely manner. Thank you for sharing with us! This is exactly the way my father cooked it when I was younger. Now I'll have to make it for dinner. Thanks for sharing!